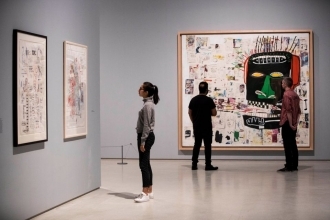 The first UK survey exhibition of Jean-Michel Basquiat's brief career was the most popular show ever staged at the Barbican Art Gallery, Jane Alison, the centre's head of visual arts, has said. Final figures for Basquiat: Boom for Real, which closed in London yesterday, are unconfirmed but are expected to reach more than 215,000. During the final weekend alone, more than 7,000 people poured through the gallery, which, by popular demand, was open until midnight on Friday and Saturday and 8pm on Sunday. By 1pm on Friday, hopeful visitors queuing out of the building and into the surrounding Barbican estate were told that tickets had already sold out for that day. One assistant suggested people come back and queue from 7.30am on Saturday and Sunday to secure one of the limited tickets available on the door. Souvenirs in the Barbican’s shop proved equally popular. While a few stacks of catalogues were still available on Friday lunchtime, only one postcard remained: a black-and-white photograph taken by Robert Carrithers of a young Jean-Michel Basquiat without his trademark crown of dreadlocks. Tote bags, mugs and umbrellas had all sold out. The show featured around 100 paintings and drawings loaned from myriad (predominantly private) collections, including those of the Austrian dealer Thaddaeus Ropac and the former tennis champion John McEnroe. Few museums—and none in the UK—own Basquiat's work. They were displayed with postcards, notes and other ephemera once owned by the graffiti artist-turned-painter, who died of a heroin overdose in 1988 at the age of 27. The exhibition now travels to the Schirn Kunsthalle in Frankfurt, where it opens on 16 February (until 27 May). The museum, which “recom­mends strongly booking early for the show”, is already selling tickets online.